This post office was never shown on a plat map but did appear on the listing on the plat map of 1899. It was open from 1896 to 1900 and Amond Iverson was the first postmaster. The mail was carried to Klevenville from Henderson by Ole Skinrude. Another source states that the post office was open in the Henderson Creamery in 1893 with Joseph R. Henderson as the postmaster. Wisconsin Post Office Handbook, revised edition No. 3, Frank Moertl. 1999 places it in the SW4 of section 14 (top map) but later moving to section 23 (bottom map). The Wisconsin Blue Book mentions this post office from 1889 to 1899 except for 1891, 1893 and 1895. 1899. 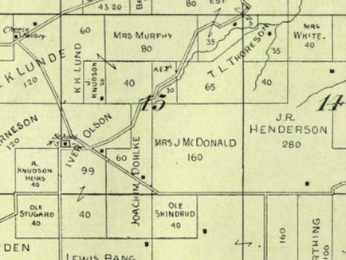 The post office was near the school and the Henderson Creamery but is not noted on this map.